If you happen to see a flying squirrel with a camera around his neck, you’re probably at one of the Out of School Time (OST) programs offered by Catholic Social Services (CSS) of the Archdiocese of Philadelphia. Last week, guest readers visited the OST sites to narrate “My Cousin Momo,” the story of a flying squirrel who struggles to be accepted by his wingless family members. The acclaimed tale by children’s author Zachariah OHora is currently the featured text in Pennsylvania’s “One Book, Every Young Child” literacy initiative. The OST reading sessions helped to mark the 2018 Week of the Young Child (April 16 to 20), an annual celebration hosted by the National Association for the Education of Young Children. Fostering childhood literacy is central to CSS’s after-school initiatives, which include 15 programs at 12 sites throughout the city. Through its OST outreach, CSS serves close to 700 students — ranging from kindergarten to grade 12 — during the academic year, and almost 900 in the summer months. Sophia, who attends Holy Innocents Parish School and the OST program it hosts, enjoys the opportunity to further develop her language skills after a day at her desk. The after-school program is “a continuation of their education,” said Dee D’Aulerio, who directs the OST site at Holy Innocents, where the average attendance of 70 to 80 students more than doubles during the summer months. A trained school social worker with more than 15 years of experience, D’Aulerio noted that many of Holy Innocents’ students have parents who are not native English speakers and who rely on the OST staff to assist the children with their homework. In addition to honing study skills, the OST sites emphasize STEM-based learning, which focuses on science, technology, engineering and math. “My favorite subject here is computers,” said Angelie, a first-grade student who attends the Holy Innocents OST program. Students begin their OST sessions as soon as their classes have ended. At Holy Innocents, snacks are served at 2:45 p.m., followed by homework and club activities, which include gardening, chess, board games, arts and crafts, music and fitness instruction. The afternoon ends at 6 p.m., when parents arrive to pick up their children. Funding for the OST program is assembled from a variety of sources, including government partners, charitable contributions and modest tuition fees. 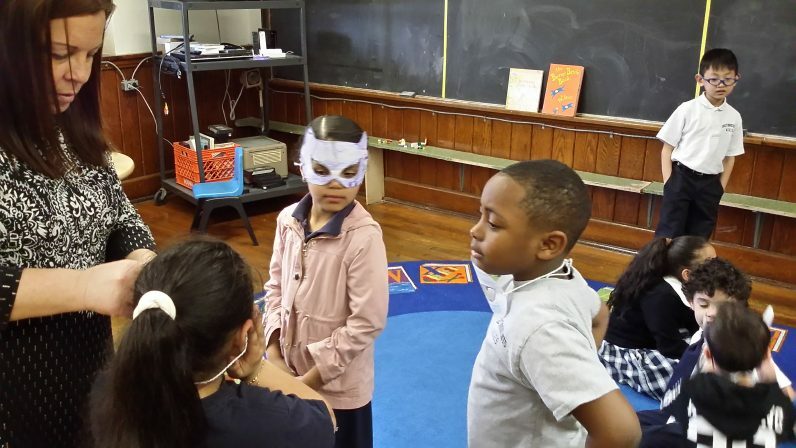 CSS has been operating after-school programs throughout Philadelphia since 1998, and has been part of the city’s OST provider network since that time. In 2005, CSS was tapped by the city to operate 10 “Beacon Programs,” school-based community centers that originated in New York City as a means of improving neighborhood safety. Five years later, the Beacon model was changed to the current OST structure. After-school programs — which trace their origins to the early 20th century — have continued to grow in response to working families, changing neighborhoods and concerns over children who lack sufficient supervision after the day’s classes end. Such “latchkey kids,” as they were once popularly called, have been shown to lag in academic and social performance. 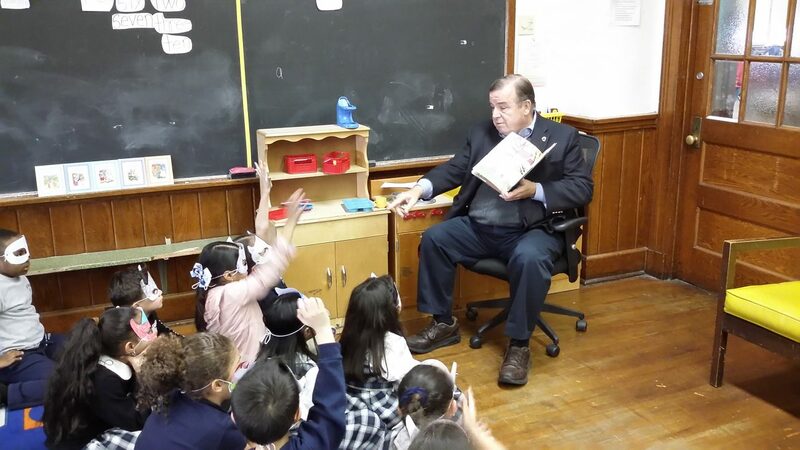 Jim Fitzsimmons, who read “My Cousin Momo” to the OST students at Holy Innocents, believes it’s vital to consistently engage and stimulate young minds — and hearts. An organizer for the annual Archbishop’s Benefit for Children, Fitzsimmons peppered his young listeners with a number of questions throughout his narration, asking why they thought it was important to welcome and respect those who are different. Fitzsimmons confessed he was more familiar with Rocky — rather than Momo — the Flying Squirrel of “Bullwinkle” fame, but he was impressed with the students’ quick grasp of the story’s key values, such as kindness and humility.